The Danish String Quartet is, in fact, only three-quarters Danish, as they are fond of pointing out; the cellist is Norwegian. They also like to joke that “being relatively bearded, we are often compared to Vikings.” They have a refreshingly light-hearted approach to their role as chamber musicians, probably because three of them, violinists Frederik Øland and Rune Tonsgaard Sørensen, and violist Asbjørn Nørgard, have been playing together since they met as schoolboys at a summer music camp. 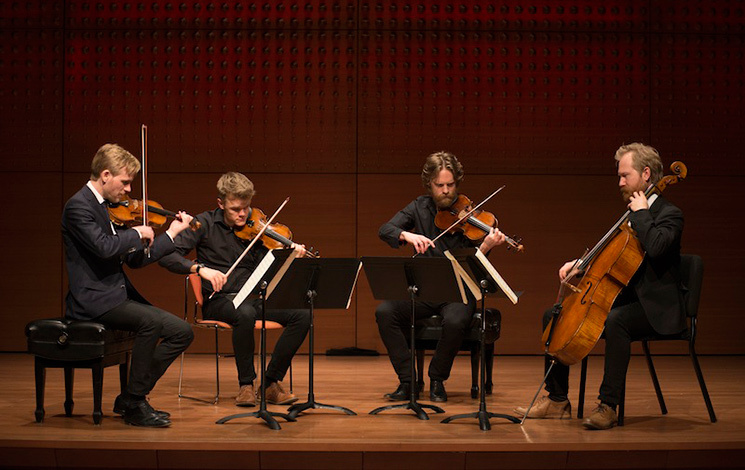 They went on to study at the Copenhagen Academy of Music, acquired a cellist, and made their quartet debut at the Copenhagen Festival in 2002. Norwegian cellist Fredrik Schøyen Sjölen replaced their original cellist in 2008, and their career was solidified the next year by winning the London International String Quartet Competition. Since then they have been regular performers at concert halls and music festivals around the world, and have won wide acclaim. Typical is this praise from The New York Times: “They play almost everything excitingly.” There was an original Danish Quartet before them, and after it disbanded the DSQ called themselves for a time “The Young Danish Quartet,” but lately have dropped the “Young,” though they are still disarmingly youthful. They have made a number of recordings, not only of classical and contemporary works but of Nordic folk music, too; a disc of this, Last Leaf, was a considerable commercial and critical success. The distinguished young British cellist Bartholomew LaFollette, a graduate of the Yehudi Menuhin School, is the cellist for the Danish String Quartet’s American tour. Joseph Haydn was not one of those musical prodigies who seem to have dropped from the heavens. He began as a boy chorister in church, and that was the only music he knew until his voice broke and he had to try to make a living. This was precarious indeed at first, and he was almost out on the street until he industriously taught himself music and counterpoint, partly by the study of Carl Philipp Emmanuel Bach. It was not until 1756, when he was in his early twenties, that Haydn was able to secure the first of his several musical posts in aristocratic households, giving him time and opportunity to compose. His Op. 1 consisted, like most of his output of sixty-eight string quartets, of a set of six; and although we do not know in what order they were composed, the first in the set won a nickname, the first of many such in Haydn’s oeuvre. It is La Chasse (The Hunt) because of the very clear echoes in the first movement, a forthright Presto, of hunting horns and galloping horses. It’s graceful music, simple and straightforward, and with no hint of the wonders to come from the so-called father of the string quartet. The next movement, a Menuetto, dances along pleasantly, with a more thoughtful central section. As so often in Haydn, it is the slow movement that reveals the profound part of his nature. This Adagio is a drawn-out song with a gentle accompaniment, led by the first violin, who decorates his aria with beguiling trills. The last movement begins with another Menuetto, this one distinguished by a series of overlapping entries, almost fugal in nature. This moves without a break into a final Presto, which features more galloping, but this time without any semblance of horns; it just shows an already accomplished but novice composer having his wind-up fun. Hans Abrahamsen was born in 1952 and has gone through various transformations in his life as a composer. After studying at the Royal Danish Academy of Music under Per Nørgård (and later with György Ligeti), he allied himself with a movement called “The New Simplicity,” which was rebelling against the rigid complexities of the European avant-garde of the time—the late sixties and seventies. Its members wrote simply, in a minimalist and determinedly plain style. Later, in the 1980s, Abrahamsen’s music became more vivid and pictorial: a typical work from this period was the dramatic Nacht und Trompeten, commissioned by the Berlin Philharmonic; he also wrote a series of piano studies prefiguring Ligeti’s. In the 1990s began a long period of creative silence, broken in 2004 by his Four Pieces for Orchestra, adapted from his piano studies, and Schnee (Snow), a spectacularly chilling orchestral piece. He had a major international success with Let Me Tell You, a monodrama for soprano and orchestra that engrossed audiences in Berlin, London, and New York, and wrote a piano concerto for the left hand (Abrahamsen has minimal use of his right), wittily called Left Alone. Currently, he is working on an opera based on Hans Christian Andersen’s The Snow Queen. Abrahamsen’s String Quartet No. 1 dates from his early minimalist phase, written when he was twenty-one. It’s called Ten Preludes and consists of ten brief musical sketches—almost like short stories—adding up to about twenty minutes of music, full of striking string sonorities. The first of them begins with a harsh outcry from all the instruments, then goes on to a series of scale-like gestures with a chugging accompaniment. No. 2 has repetitious figures that sound like a country fiddler before merging into a succession of rhythmic chords. No. 3 begins tonally, with a series of sustained chords that develop into a melancholy theme that climbs higher and higher. No. 4 starts with a swaying motif before moving into a series of scale-like passages. No. 5 is the quietest Prelude, hushed almost to the verge of inaudibility, with a quiet ticking motion. No. 6 is another mournful one, made up of long, quiet, sustained notes. No. 7 finds the upper strings sawing away before they jump into a skittering pizzicato, then on to another country-fiddler moment. No. 8 features a series of descending gestures, before a sawing effect from all the instruments is heard again. No. 9 is almost hymn-like in its series of sad chords. The last Prelude is a complete surprise: a fleet, almost Mendelssohnian movement, lively and tuneful, that concludes the work quite like a conventional classical quartet. The circumstances of Ludwig van Beethoven’s life in 1825 are, sadly, well known. At this point he was totally deaf, exhausted from the completion of the Ninth Symphony, worried about the guardianship of his troublesome nephew Karl, and suffering from severe gastric distress. He had already begun work on the second of the quartets commissioned by a Russian prince when he was warned by his doctor that he must go on a strict diet—no coffee, wine, or spices—and should spend some time in the country. It was here, in the Viennese country suburb of Baden, that most of his String Quartet No. 15 in A minor, Op. 132, was written, reflecting both his sorrows and joys of the time as he suffered and recovered. It is difficult to think of this as anything but the greatest of Beethoven’s extraordinary succession of late quartets. It encompasses a greater emotional journey than most, and has acquired a remarkable literary aura as well—having apparently helped to inspire T.S. Eliot’s Four Quartets, and also formed the basis of the remarkable passage in Aldous Huxley’s Point Counter Point, in which he evokes the ineffable depths of the quartet’s slow movement, in the context of a character’s suicide. The quartet begins with a four-note motto theme that recurs, in an infinite series of guises, throughout. There is a marvelous development section, followed by a ravishing dance-like episode, before the cello takes the lead toward a further development that bustles through a series of fleeting but always absorbing moods. The Scherzo that follows has another motto, this time a five-note one; there is a cheerfully dancing trio section before a reprise of the opening. This is probably the quartet’s most conventional movement. The great slow movement—inscribed by the composer as “A song of thanksgiving by a convalescent to the deity, in the Lydian mode”—plumbs remarkable depths of emotion. Its shape is clear: there are three adagio sections, each launched with an eight-measure prelude, which devolve into a hymn-like theme played in extremely slow tempo; The Lydian mode of the movement’s inscription employs only what would on the piano be the white keys and is reminiscent of Gregorian chant. These somber adagios alternate with two strikingly contrasted sections of life-affirming energy that symbolize the joy of recovery from sickness. They have everything the slow sections lack: rhythmic vitality, vivid trills, exuberance. In each appearance, the sections are more elaborately decorated, until, in its last appearance in the movement, the Lydian theme is treated fugally and rises to a climax of heartbreaking intensity, in which Beethoven seems to penetrate to the essence of human sorrow and vulnerability. The brief movement that follows, Alla Marcia, is almost deliberately banal, bringing us suddenly and dramatically back to earth. This segues without a break into the final movement, which is a sort of rondo—a moto perpetuo that throughout is striving toward a note of triumph that is ultimately achieved. The central section has an exhilarating rocking motion before the music speeds up towards a wonderful and meticulously constructed coda that shows off Beethoven’s extraordinary inventive gifts to the fullest. The whole quartet is a deeply affecting and ultimately bracing journey from the depths to the heights.